camera shakes, defocussing, or the rapid movements of the object. Here we present SmartDeblur, a user friendly tool with comprehensive features aiming to remove the blurs and recover the details. 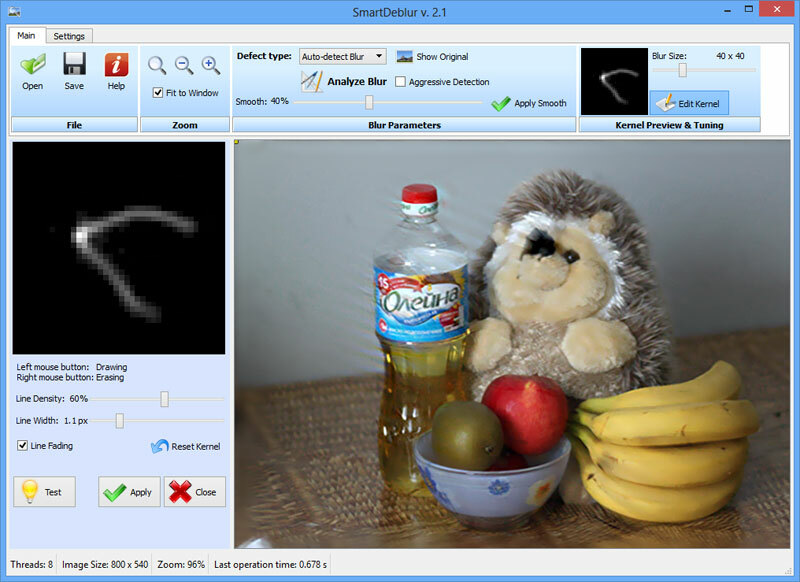 SmartDeblur has easy and user friendly interface with built-in help and examples. Just load your blurred image and click on the &quot;Analyze Blur&quot; button - the rest will be done automatically! Also SmartDeblur has many advanced options to tune obtained results - kernel editor, manual analysis region selection etc. Statement: First, please download the orginal installation package by clicking the download link. Of course you may also download it from the publisher's website. Using SmartDeblur crack, key, patch, serial number, registration code, keygen is illegal. The download file hosted at publisher website. We do not provide any download link points to Rapidshare, Hotfile, Depositfiles, Mediafire, Filefactory, etc. or obtained from file sharing programs such as Limewire, Kazaa, Imesh, Ares, BearShare, BitTorrent, WinMX etc. Software piracy is theft. If you like SmartDeblur please buy it.